One of the many joys of Summer is picnicking outdoors whether at home on your patio, deck or in the garden or at a lake, outdoor concert or the beach. 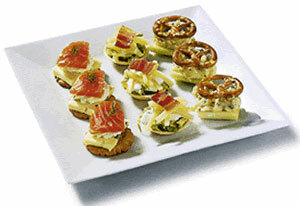 For a more sophisticated picnic, try some of these delicious sandwich recipes using a selection of German cheeses and learn more about the variety of German cheeses and breads available in the US. You can learn more in the Product Gallery. 1. 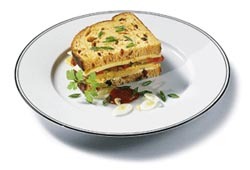 Allgäu Emmentaler and Bavarian smoked cheese with tomatoes, chili sauce, sliced apple, spring onion, tomato and mixed green salad on sun dried tomato bread. 2. 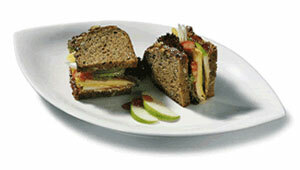 Bavarian blue brie with slices of apple on rye bread. 3. 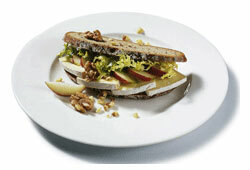 Allgäu Emmentaler and blue brie cheese on a bed of tomatoes and chili sauce, garnished with apple and salad on pumpkin seed bread. 7. 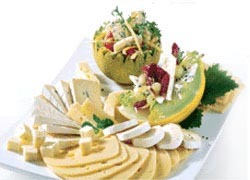 A bountiful and colorful cheese selection is even more appetizing when served with fruit such as melon. The fruit shell can also be used as a serving bowl for salads.